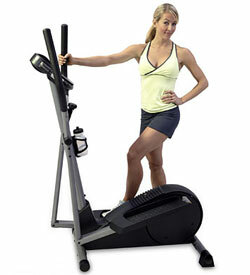 For only $300, you can get the Proform 675 CardioCross elliptical trainer. It’s a bare bones, manual elliptical machine that is designed just for home use by individuals who have an extremely tight budget. It’s a short list of features, but that’s what you should expect for this low price. The resistance is manual, and the upper body workout is synched with the lower body workout rather than being independent. Trainers just don’t feel that Proform’s 675 CardioCross has much going for it. First, the manual resistance doesn’t give you the options that varied resistance settings on a more expensive model can give you. Second, they universally feel that the 14” stride is far too short. Some go so far as to say it’s closer to a step machine than an elliptical trainer when the stride is this short. Those who’ve purchased the Proform 675 CardioCross elliptical trainer often end up with problems. The most common complaint is the rickety construction. It tends to shake and rattle when you reach higher speeds or more resistance. The jerky feeling of the short stride is also disappointing for many; one user said if you’re over 5’9”, the workout feels “incomplete,” without working all of the muscles that it should. Even if everything else were a thumbs up, we’d have to forego recommending the Proform 675 Cardio Cross because of the elliptical trainer’s extremely short stride. Fourteen inches just doesn’t give you a full elliptical stride and you won’t get the real benefits of a cross training workout on this machine. But when you consider that this is also a cheaply constructed machine with a poor warranty, you should know that you should either look elsewhere or wait until you have a few hundred more dollars so that you can get a better model from the Proform line. Put in simple terms, the Proform 675 CardioCross elliptical trainer is a disappointing machine that won’t give you what any respectable elliptical should.